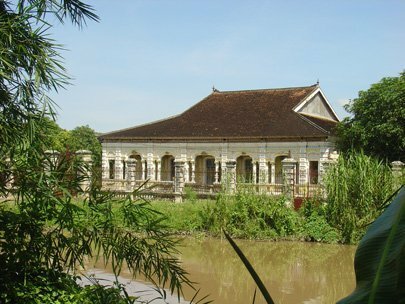 Thot Not is not only the most populous and wealthiest district in the Mekong Delta city of Can Tho, but it is endowed with a number of cultural relics, craft villages, splendid islets and many ancient houses. The best of it is located along Hau River, namely Ba Ca Old House. To reach the house, departing from Thot Not District, tourists ride on National Road No. 91, heading to Can Tho City for two kilometers then take a left turn to Ba Ca Road. You pass an immense rice field and ride for another kilometer to Cai Ngai Cannel and once you turn left for 100 meters, you will reach Ca Ba Old House. The ‘old house’ is a complex of three houses built by three brothers in the Ca Ba family who had a passion for collecting antiques. The antiques remain well preserved in the largest house. The complex of houses is located in Quy Thanh 2 area, Trung Kien Ward, Thot Not District. The old house was built in 1918 and completed in 1925 with French architecture in harmony with traditional southern design with a tiled roof, brick walls and wooden pillars. The house is protected very stringently with a brick gate, two iron doors and a corridor of pillars decorated with meticulous and elegant patterns. The pick of the antiques is a manchon lamp, hung amidst the ceiling which now has become a nest for a flock of birds, wooden parallel sentences, worshipping tools for forefathers, old weapons and sideboards inlaid with conch. In front of the house is a delightful bridge where tourists can take snaps of the panoramic view of the house lying gently in canals, trees and flowers.